In the second of the Mindsight series, Ciara Kelly has moved to New York, where she has bought a condo and works for the Fairfield Funeral Home, but her scars still cause her torment. Her psychiatrist is vehement that, because of her PTSD, Ciara must stay away from anything that will remind her of her ordeal. But Ciara becomes obsessed with an ongoing case of a serial killer targeting teenage girls. Soon, she becomes determined to help the police catch this killer. But when Ciara begins to suspect who the killer might be, and the police dismiss her hunch, she finds herself in mortal danger. I fell in love with the character of Ciara Kelly. She has some issues since her abduction a few years ago. Regardless she is doing her best to get on with her life and to help others if possible with her ability to see the last moments of a person's life. I also really enjoyed Detective Nemos who is willing to look beyond the obvious and accept Ciara's help to stop this killer who is targeting teenage girls. If only all detectives would put aside society's beliefs to catch a killer. Wow! 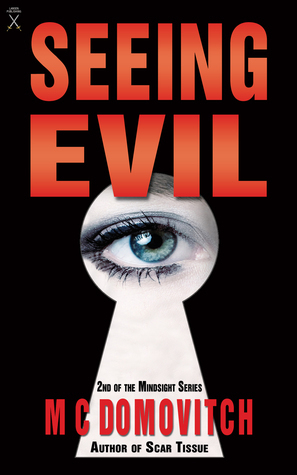 SEEING EVIL is a well written suspense that will keep the reader on the edge of their seats. And I have to admit that I didn't even realize that this was the second book in this series until I went to grab the blurb for this review. Kudos to the author for doing such a great job on this book that it stands all on its own merits. 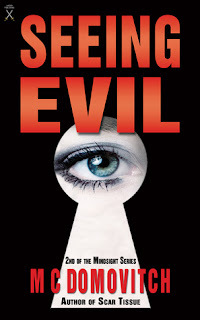 I really think that my readers who enjoy a good thriller should check out SEEING EVIL. 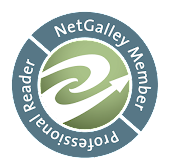 I know that I am looking forward to the next book in the Ciara Kelly saga.